Morocco. It was good to finally get here. I had originally planned to spend more time here, but the delays waiting for repairs had meant our time here would be squeezed. Marina Smir was more than half empty so we picked a nice spot and moored up. Our first job was to locate an ATM as I’d spent all our Euros on the marina fees – their EFPOS machine wasn’t working. A regular occurence I suspect. So off we went looking for an ATM. There was one at the marina but it also wasn’t working. So we called into the hotel at the marina and got some local coin before hopping on a local bus to M’Diq. That was a quick emersion into the land of Arabs. The bus was jam-packed and kept on stopping to pick up yet more people. I was still getting used to the culture shock when I got off. We wandered around M’Diq and found a few ATMs, none of which took our cards. They would do a cash advance on Visa but not on our normal bank cards from Australia and Canada. Eventually we did find a bank that did the trick and got some dirhams (dh). Stan at this stage was getting hungry (or should I say hungrier) so we found a local street with lots of Moroccans eating and picked out a restaurant. We all had local fish and Stan ordered a Paella for good measure. It was beautiful, lots of wonderful Moroccan flavours. I think Stan was in heaven. Next morning, we went in search of a driver to take us to Fez (or Fes as the locals spell it). We found Mohammed, via Rashid, the same driver Ooroo had. We paid Mohammed €300 to drive us to Fez and Tangiers over two full days (and nights). It took us 4 hours, plus a stop for lunch, to get to Fez. It was a beautiful drive, Morocco had experienced a lot of rain and it was very green and lush. We passed through lovely little villages, with the new and old combination of Massey Ferguson’s and donkeys. Lunch was interesting at a restuarant outside a petrol station, with its own “modern butcher” attached. The moroccan lamb was delicious. The goat was ok – an experience. We got to Fez about 3 and Mohammed hooked us up with a local guide, who calls himself Sammy, because of his pretty good resembalance to sammy davis jnr. He turned out to be a pretty good name dropper, saying he’s taken the real sammy davis around as well as our mate, ray martin. The medina at Fez is a real rabbit warren and I reckon a guide is a necessity. There’s 350,000 fezites living in this ancient walled city and a whole heap more living outside – just over a million in total. Walking around with sammy, we went through a maze of small alley ways that openned up into beautiful architecture. Its like going back in a time machine. The whole place is a maze of shops, all serviced by donkeys. Its said to be the world’s largest contiguous car-free urban area. We managed to cram in all the major ancient sites, including Al-Qarawiyyin, which was founded in AD 859, and is claimed to be the oldest university in the world – although now its a huge mosque. Sammy also took us to one of the beautiful guesthouses, it was amazing, 6 star luxury and exquisitely decorated with a lovely pool in the centre of the courtyard. Everything you imagined about staying in an exotic location. At €160 a night, it seemed very reasonable. Then I stopped dreaming and went off to my €20 a night actual accomodation. Successfully checked in, we got Mohammed to drive us around to a few of the moorish castles that guarded the entry to the town for some sunset photos. Then it was back into the medina for dinner, to savour some more moroccan spices. Yum. As we ate, Mohammed filled us in on life in Morocco. He was proving to be an excellent driver and excellent companion. Next morning, it was up early for a walk to the jewish quarter. Along the way we came across one of the Saharan nomads who was walking into town to sell his rugs. Needless to say, La Mischief now has a new rug and Stan has a new moroccan hat. And best of all, we managed to avoid the medina marfia as he called them – all the people who get their cut along the way. We never did find the jewish quarter, and with time against us, we headed back to the medina, albeit the other side to where our hotel was. We had the choice of walking around the outside or straight through the middle. We chose the middle -of course We ended up breaking up and Stan beat us back to hotel by quite a mile. I worked out my mistake was to take directions from the locals and these directions ineveratibly lead past a relative’s shop, and not necessarily to our particular hotel. Anyway we eventually found the hotel and checked out, and then we were on our way with Mohommed down to the coast and along it to Tangiers. Another magnificent drive, passing through an old disused border crossing from the days when morocco was divided into spanish and french colonies. After a lunch that cost us about $25 for 4 of us (make that 5 – Stan eats for 2) at a packed restaurant in a coastal town, we headed for Tangiers. Our first stop was the Pillar of Hercules, where thee was a cave that opened up underground to the coast. Very spectacular. Parts of it had been chiseled out to mine the marble, which could still be seen. Then it was onto the famed Kaspar in Tangiers. Mohammed dropped us at the top and we walked down the narrow winding streets to the bottom. Couldn’t really get lost as all you had to do was to keep heading down until you got to the port. After an ice cream and some freshly squeezed orange juice, we found Mohammed and headed back to Marina Smir. No time to find a bar owned by a guy called Rick. Maybe next time. The drive back was equally impressive as we drove along the cliff tops overlooking the Straits of Gibraltar, before cutting across the mountains and dropping down onto the East Coast where Marina Smir was located. Mohammed dropped us off well after dark after a couple of amazing days. Next day, Stan and Judy went off driving, whilst I stayed around the marina and did some chores. After, or maybe it was during, I found time for the obligatory camel ride with the equally obligatory pictures of Steve on a camel in front of La Mischief. What else can I say. As the chores involved the internet, it was also obligatory to visit one of the bars/cafes that run along the front of the marina. Now if you are going to run into other Australian yachties, then there is a fair chance you will do in in such an establishment. And sure enough, I did run into Kevin and Di who’d just bought their Benneteau about a week ago. I also ran into David and Jenny Pakes off Windjammer, who happen to be related to an old lawyer of mine. Great to catch up with other Aussies in far away places. Especially guys who are far more experienced and knowledgeable than novice sailor Steve. Next morning, we followed Kevin and Di back to Gibraltar, as they were heading for Queensway Quays marina and they suggested we did too. The currents through the Straits of Gibraltar are quite strong because the Med is actually lower than the Atlantic due to the amount of evaporation. That’s good news as evaporation must mean sun – something we’d been in somewhat short supply of so far this trip. There’s an optimum time to leave Barbate to catch a good tide through the straight, but we decided to leave a couple of hours before this as we were keen to get safely into a marina according to our 2pm rule, as this is a notoriously windy part of the world. THe winds tend to be all over the place down here. Its effected by many things – the Atlantic northerly trades, the warm air off the Saraha and the tunneling effect of the Straits themselves. We started off beating into the wind and then it gradually shifted south and then West, dropping off to next to nothing. Then it slowly built to 10-15kts and by the time we passed Tarifa we were flying our geneker. 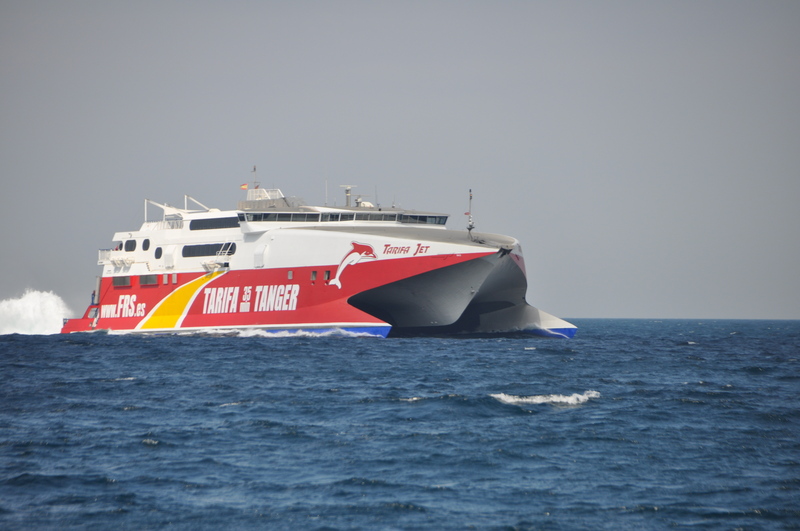 We kept it up all the way to Tangiers as we gybed and dodged the shipping, which wasn’t too bad, excepting for the Tangiers ferry that came directly for us at 35kts. 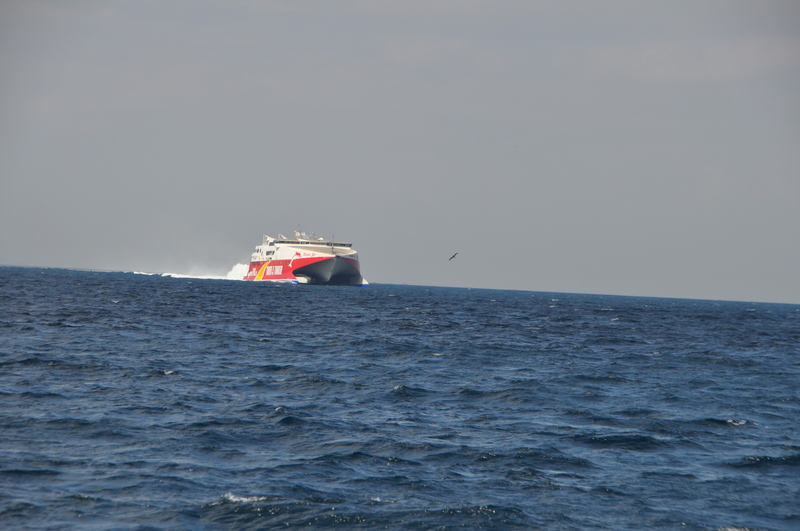 It was an awesome sight as it slipped past our stern. We had a great time watching the dolphins play all around us and I even saw a sun fish. Another first for me. By the time we had crossed the shipping lanes and got to the Morocco side, the wind had built to 25kts and we pulled down the geneker. We passed by Tangiers and then the Spanish enclave of Ceuta, a bit like a Spanish version of Gibraltar in Morocco. By the time we rounded the Cape at the end of the Strait, it was blowing 35kts and we had a couple of reefs in. Then as we went down the Moroccan coast it dropped away again. We motored the last little bit into Marina Smir, where we would stay for our entire stay in Morocco. It as good to be in the Med. Felt like quite an achievement.